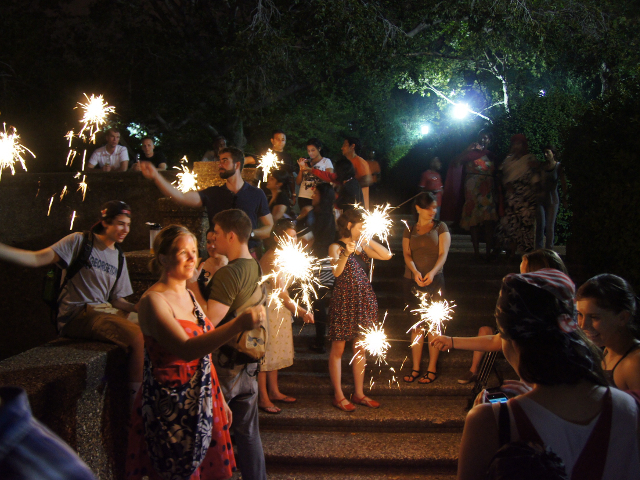 Residents of Washington D.C. celebrate the fourth of July. Photo by Tedeytan. Across America, cities are stepping up to the plate on sustainability. In honor of the 4th of July, America’s Independence Day, here are four of her most sustainable cities. There are many ways a city can pursue sustainability, and often, a combination of tactics is needed. Each of these paragons of sustainability – Portland, Austin, San Francisco, and New York – has effectively pursued sustainability through many avenues. However, they each excel in different arenas, and today they serve as an example of the many ways a city can pursue sustainability. Declared by many to be the most bikeable city in the United States, Portland, Oregon has over 250 miles of dedicated bike lines, some on roads, some off-street bike paths. A quarter of Portland’s workforce commutes by bike, carpool or public transportation with about 9,000 city residents biking downtown every day. This is likely in part due to Portland’s continued innovations in making their city bike friendly – Portland was the first city to implement bike boxes, an inexpensive safety adjustment which uses road markings to help avoid bike to car collisions at stop lights. They also encourage commuting by bike by starting residents at a young age – Portland is the birthplace of the bike commuting train, where elementary school children gather to bike to school together, increasing safety and visibility for the young cyclists, while instilling a practice of commuting by bike as early as possible. Portland’s sustainable efforts are broad. A culture of sustainability and DIY, playfully mocked in the T.V. show Portlandia, is crucial to this city’s success in becoming one of America’s most environmentally friendly cities. Portland’s culture of sustainability helped it to become the first American city to adopt a climate change action plan, and supportive residents have helped to establish zoning regulations that will fight sprawl and encourage dense urban growth, so that undeveloped land is left for agricultural purposes. New York’s density alone makes it one of America’s most sustainable cities. New York City’s public transport system shuttles its population of over 8 million people around the city so efficiently that only 20% of New Yorkers drive their own vehicles on a regular basis. Its tall skyscrapers are more energy efficient than single-family homes, and the vertical growth of the city has helped to conserve land as well. New York also manages to be pretty pedestrian friendly, with an abundance of public green space and beautiful parks. In 2009, New York turned sections of its iconic Times Square into a car-free pedestrian zone, setting the tone for a continued effort to make the city more pedestrian and bicycle friendly. San Francisco leads the way in many sustainability arenas, thanks in part to voters who aren’t afraid to support laws that ban plastic grocery bags, or pay for renewable energy for public facilities. Perhaps this can-do, environmentally-conscious attitude is how San Francisco has managed to divert 70% of its waste from the landfill through mandatory composting and recycling programs. In addition to its effective recycling program, San Francisco is working hard to be America’s solar energy leader, having stated that they eventually want to rely on 100% renewable energy, though the mayor’s taskforce on renewable energy acknowledges that this will likely not happen in the next ten years. Along with its efforts in waste reduction and renewable energy, San Francisco is full of urban farms, generating impressive amounts of locally grown food. It’s pretty pedestrian friendly too-nearly half of all San Francisco residents bike, walk or take public transit every day. Austin has declared that it aims to be carbon neutral by 2020, and it’s on the right track. Austin is home to the largest local government to run on 100% renewable energy, and is working to shift its residential, commercial and industrial energy consumption to clean sources as well. Recent investments in wind have expanded the city’s renewable energy portfolio, putting Austin ahead of schedule as it works towards its goal of relying on renewable energy for 35% of its power by 2020. Austin’s building codes are sustainability oriented as well, and energy audits are required when selling a house. In addition to its goal of carbon neutrality, Austin, the birthplace of Whole Foods, continues to support local and organic food. Now, it is home to America’s first zero-waste, packaging-free grocery store, In.gredients. All of these cities are not only examples of specific ways to be sustainable, but they manage to work towards sustainability in many categories. In order to be truly sustainable, cities must take a holistic approach in their planning and decision making. By following the leads of Austin, New York City, San Francisco, and Portland, cities can create wonderful environments for people to thrive and grow, without damaging the environment we rely on to survive.